The purpose of this site is to increase positive thinking and happiness for all sentient beings. Here you will have access to the teachings of the Buddha and especially to the history, teachings and current activities of the Dzogchen Lineage of Buddhism. In its broadest sense, Dzogchen Lineage refers to the limitless expanse and continuous wisdom of Vast Awakening, the Buddha Nature which is the natural enlightened lineage of wisdom and compassion that exists in the mind of every single sentient being. Dzogchen Lineage also refers to the specific transmission of the Buddha's teachings known in Tibetan as "Dzogchen," or "Great Perfection." This is a living lineage that exists in this world, having been passed from master to disciple from the time of the Buddha to the present. The Dzogchen Shri Singha Foundation is pleased to announce the 8-day 2018 Dzogchen Winter Retreat led by Eminent Bodhi Lama Kunzang under the guidance of Dzogchen Khenpo Choga Rinpoche. The retreat will take place at the Dzogchen Retreat Center near Eugene, Oregon, USA. CLICK HERE to view the teaching. 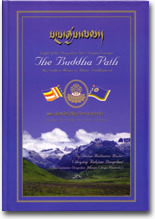 The Second Edition of The Buddha Path has been reprinted. CLICK HERE to order a copy of the The Buddha Path. CLICK HERE to read more about The Buddha Path. To find a Buddha Path Practice group in your area, please visit our Dharma Center page.